Kenya lies astride the equator on the eastern coast of Africa. Kenya is bordered in the north by Sudan and Ethiopia, in the east by Somalia, on the southeast by the Indian Ocean, on the southwest by Tanzania and to the west by Lake Victoria and Uganda. Kenya is notable for its' geographical variety. The low-lying, fertile coastal region, fringed with coral reefs and islands, is back by a gradually rising coastal plain, a dry region covered with savanna and thorn bush. At an altitude of about 1,524 m and 300 miles inland, the plain gives way in the southwest to a high plateau, rising in parts to 3,048 m, in which about 85% of the population and the majority of economic enterprise are concentrated. The northern section of Kenya, forming three-fifths of the whole territory, is arid and of semi desert character, as is the bulk of the southeastern quarter. In the high plateau area, known as the Kenya Highlands, lie Mt. 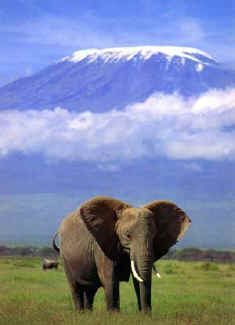 Kenya (5,200 m), Mt Elgon (4,322m) and the Aberdare Ranger (rising to over 3,963 m). The plateau is bisected from north to south by the Rift Valley, part of the great geological fracture that can be traced from Syria through the Red Sea and East Africa to Mozambique. In the north of Kenya, the valley is broad and shallow, embracing Lake Turkana (160 miles long), while further south it narrows and deepens and is walled by escarpments 610 to 930 meters high. West of the Rift Valley, the plateau descends to the plains that border Lake Victoria. 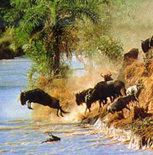 The principal rivers are the Tana and the Athi, flowing southeast to the Indian Ocean, the Ewaso Ngiro flowing northeast to the swamps of the Lorian Plain, and the Nzoia, Yala and Gori, which drain eastward into Lake Victoria. Low plains rise to central highlands, divided by the Great African Rift Valley.